Software industry body Nasscom on Friday hit out at the US H1B visa legislation, introduced in the Senate yesterday, saying its provisions are targeting Indian firms and restricting their ability to compete in the US market. Nasscom said though the stated objective of the Bill is to prevent fraud and visa abuse, several of the provisions of this Bill are against the principles of free trade. “In many ways, it is targeting Indian companies and restricts their ability to compete in the US marketplace. This is also against President Obama’s stand against protectionism at the G20 Summit,” Nasscom President Som Mittal said. The almost USD-billion Indian IT outsourcing industry draws over 60 per cent revenue from the US and many of its skilled workforce work onsite on H1B visa for the client. 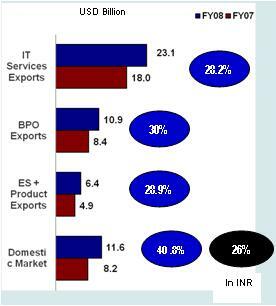 Indian companies had been allocated only 12,000 visas in 2008, out of the limit of 85,000 visas. The data from USCIS shows that in April 2009 till date, it has received about half the H-1B visa applications against the cap for FY10. This clearly demonstrates that companies are not using the H-1B Visa route to replace US workers. US does not have a temporary service visa as in other countries and companies that do send highly skilled engineers on H-1B visas are for temporary period with average stay in US of less than two years, he added.